Gov. 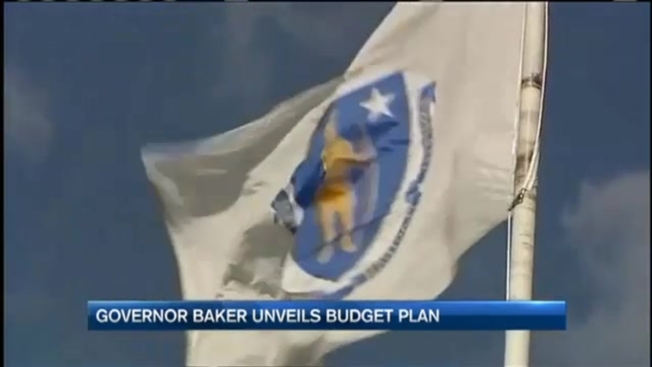 Baker Unveils $38B Budget Plan for Mass. Gov. Charlie Baker took the wraps off his first state budget on Wednesday, a $38 billion plan that calls for a 3 percent increase in overall spending but includes no new taxes. The budget being submitted to the Democratic-controlled Legislature seeks to close what the Republican administration said was a $1.8 billion gap between projected spending and revenues for the fiscal year starting July 1. While the budget proposal includes more than $1 billion in new spending, the administration said the 3 percent hike contrasted with a nearly 8 percent increase in spending in the current year. That and other measures is enough to close the budget gap, Baker said. Officials say the plan includes a number of steps to curtail what otherwise would have been greater spending growth, particularly in the state's Medicaid program, where expenses were projected to rise 16 percent but would rise less than 6 percent if all of Baker's proposals are approved. "By right-sizing the budget now and investing in transportation, education and our communities, we are making Massachusetts a better place to live, work and raise our families," Baker said in a statement. Governors generally submit their budget proposal to the Legislature by late January, but as a new chief executive Baker was given an extension of several weeks. The spending plan will now be reviewed first by the House and later the Senate; both chambers will vote on their own versions of the budget before a compromise is reached. The governor and lawmakers earlier moved to close a $768 million shortfall in the current year that Baker said he inherited from the administration of Gov. Deval Patrick. The Baker administration said it was not proposing any changes in Medicaid eligibility requirements and only one benefits change - eliminating coverage for chiropractic services. The predicted savings would instead be achieved, in part, through a redetermination of eligibility among current Medicaid recipients. Baker's plan calls for 20 percent hike in transportation funding, including a nearly $65 million hike in state subsidies for the Massachusetts Bay Transportation Authority, the Boston-area transit system that has been beset by breakdowns during a recent stretch of severe winter weather. State aid to public school districts would rise by $105 million, or 2.4 percent, and unrestricted aid to cities and towns would see a $34 million, or 3.6 percent, hike. The budget includes a 3 percent net increase for the state's public colleges and universities, but administration officials were not immediately certain if that would be sufficient to continue a two-year freeze on tuition and fees at the University of Massachusetts. Baker had vowed during his campaign for governor and several times after taking office not to raise taxes despite the state's fiscal woes. House Speaker Robert DeLeo has also ruled out new taxes, though Senate President Stanley Rosenberg has not made such an iron-clad commitment. The governor proposed doubling the earned income tax credit for low-income working families and the elimination of a state tax credit designed to boost the film industry in Massachusetts. The spending plan would not withdraw any funds from the state's so-called Rainy Day fund, but redirects about $300 million in capital tax gains proceeds that would otherwise be added to the reserve account. The administration is anticipating $87 million in revenue next year from the opening of the state's first gambling establishment, a slots parlor in Plainville. Two resort casinos approved by gaming regulators are still several years away from opening.